An unfortunate miscue on pit road left Denny Hamlin without enough fuel to make it to the finish in Sunday’s NASCAR Sprint Cup Series race at Chicagoland Speedway, with the #11 FedEx Ground Toyota running out on the final lap to finish 16th in the Chase for the Sprint Cup opener. Hamlin made his final pit stop of the day from fourth place with less than 40 laps remaining, looking for an adjustment to help tighten up the car while receiving four fresh tires and a full tank of gas. However, the FedEx crew was so quick on the stop that the fuel tank wasn’t full when Hamlin pulled away. Crew chief Darian Grubb informed Hamlin that he was four laps short of making it, forcing him to conserve the rest of the way, finally running out just before taking the white flag. He coasted to the finish line in 16th place behind race winner Brad Keselowski. Hamlin started eighth and ran in the top-10 throughout the 267-lap event on the 1.5-mile oval. Battling a loose condition on corner entry, Hamlin and Grubb worked together to dial in the #11 machine. They got the car at its best just before the final stop. With the finish, Hamlin is fourth in the Chase standings following Chicago, tied with Kasey Kahne and Clint Bowyer after the first of 10 playoff races. They trail leader Keselowski by 15 points. Jimmie Johnson is second, followed by Tony Stewart. 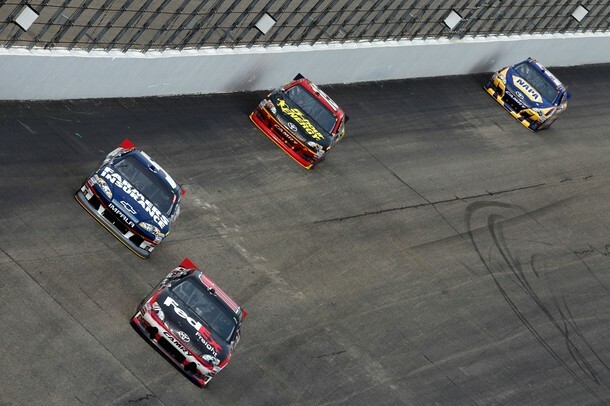 The Series shifts back to New Hampshire Motor Speedway for Round 2 of the 2012 Chase. Hamlin dominated the summer race at the one-mile Loudon oval, leading 150 of 301 laps en route to a runner-up result. A slight miscommunication with Grubb saw the #11 machine take four tires on the final pit stop while the other front runners took just two, and Hamlin relinquished the lead to restart 13th after the final caution. With the faster car on the track, Hamlin sliced through the field as the laps clicked, picking off positions throughout the final run before running out of laps to catch eventual winner Kasey Kahne. Hamlin’s 8.5 average finish at New Hampshire is the best among active drivers at the track, with nine top-10 finishes in 13 races, and only one finish outside the top-15 in his career at Loudon. Denny Hamlin will chat with fans of the #11 team on the official FedEx Facebook page on Tuesday, September 25 at 6:30 p.m. ET, live from Joe Gibbs Racing. Fans can log onto www.facebook.com/fedex to submit their questions for Denny and watch the chat live. The FedEx Freight center in North Harrisburg, Pa., will be recognized with its NHSM code letters on the #11 FedEx Freight Toyota this weekend at New Hampshire Motor Speedway. FedEx Freight Priority now has the fastest published transit times of any nationwide LTL (less than truckload) service. How do you approach this weekend’s race at New Hampshire?